Drink free wine at lunch on July 15. I’ll fill your glass to the brim. Come, take home a raven as a souvenir! I lied, I’m not actually allowed to pour the wine. I’m too messy to have contact with liquids that stain. Luckily, you can’t pour cheese. Here’s the scoop, come out tomorrow between noon-3pm and try some wines from Ravenswood Winery in California (Sonoma Valley to be precise). 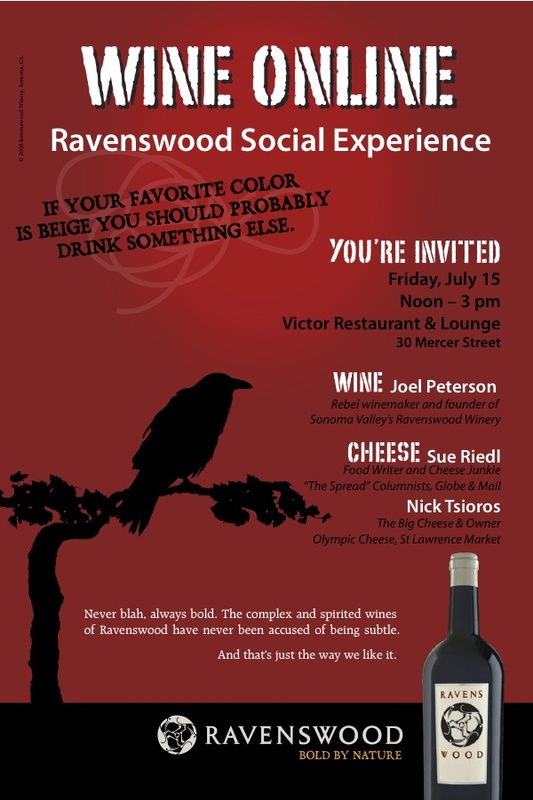 Joel Peterson, Ravenswood’s wine maker will be there and for once you won’t have to talk about the weather as where he lives–it’s nice all the time. He’ll never say, “whoa, three days of sun, awesome!” But he will tell you about his Zinfandels and Shiraz and a special blend called ICON. And you’ll be sober enough to go back to work (functionally sober I mean) as Nick from Olympic Cheese and I will fill you up with delicious fromage. And if you feel sad that you can’t talk about the weather, I’m there for you. “Humid today, eh?” I promise to say. DEETS: July 15, 12-3pm, Victor Restaurant and Lounge, 30 Mercer Street RSVP marian@eventrix.ca as numbers are limited.